With excellent defense throughout most the game, Panathinaikos beat Olympiacos to come one win away from the Greek League repeat. Panathinaikos shut down archrival Olympiacos 73 – 58 at home in Game 3 of the Greek League Finals, to take a 2-1 lead in the best-of-five series. 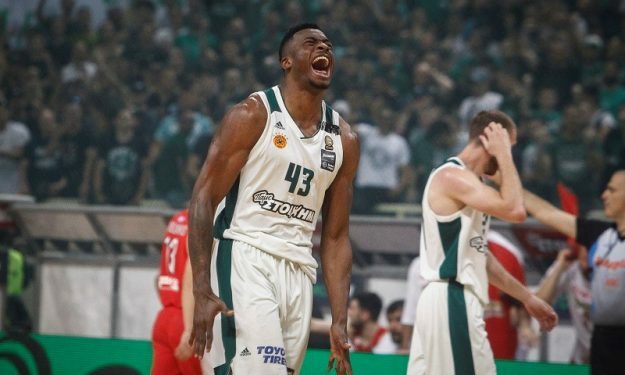 The Greens now have to opportunities ahead of them to win the back-to-back domestic title while Olympiacos marches to a do-or-die game at Piraeus, Thursday. Everything in Game 3 was pretty much said and done with seven minutes left to play. Panathinaikos was already leading 54 – 42 but turned on its engines on both ends to increase this advantage even further. After Mike James scored one of his trademark step-back jumpers, Nick Calathes drained a 3-pointer for the 63 – 44. This proved to be the dagger of the game since the only thing that Olympiacos managed in the remainder of the match was, cutting the deficit to single digits for a bit. Panathinaikos displayed an excellent defensive effort throughout most of the game and despite shooting merely 4/11 from the line in the first half, they managed to head to the locker rooms with a double-digit lead, 38 – 28. The Reds struggled big-time with their offense, finishing the first half with a poor 30% from the field. Their problems, remained in the third period since Panathinaikos’ defense, on one hand, and their inability to connect to the basket, allowed the hosts 54 – 42 lead at the end of the third period. It was a bittersweet victory, as Panathinaikos mourns the passing of former President Pavlos Giannakopoulos. At the start of the game, one minute of silence was held in order to honor his memory.